IF there’s a sure-fire way to impress your Irish granny, it’s to sing for the Pope. 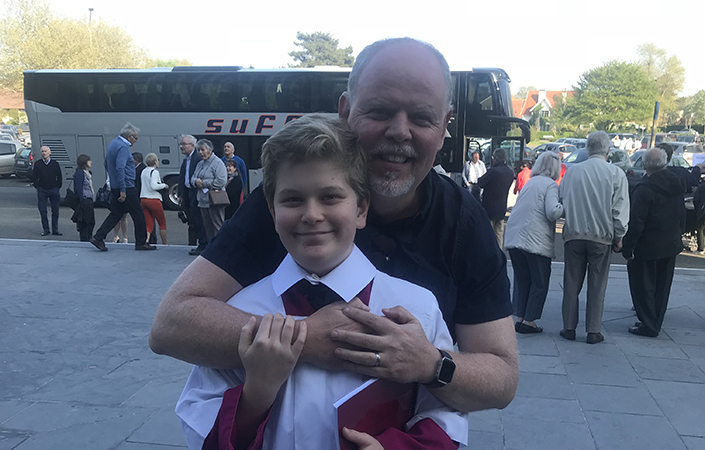 Oisín O’Sullivan’s Killarney grandma has been bursting with pride since he sang for Pope Francis with his fellow choristers from Australia’s oldest choir on Pentecost Sunday. The 12-year-old has been a member of Sydney’s St Mary’s Cathedral Choir for four years and said the performance in St Peter’s Basilica in Rome was “the biggest thing we’ve ever done”. “It was really exciting,” he said. Oisín said the Pontiff, who was standing only 10m away, was humble. The Papal Mass was the highlight of three-weeks of performances in France, Brussels and Italy to celebrate 200 years since the choir was founded by Dubliner Catherine Fitzpatrick. In total, 32 young scholarship students from St Mary’s Cathedral College and 11 adult singers performed. Oisín and his dad, Pádraig O'Sullivan on the tour. The performance was broadcast to millions around the world. Oisín’s father Pádraig O’Sullivan is from Killarney and has been in Sydney for 23 years. He said both the Australian and Irish sides of the family were thrilled by the youngster’s accomplishments – especially his grandmother Breda O’Sullivan in Muckross. Mr O’Sullivan said all the choirboys had worked extremely hard to earn the amazing trip. In an average week, the singers rehearse and perform for 10-plus hours, before and after school and on Sundays. Extra rehearsals will also take place in preparation for a special anniversary Mass in August that will be attended by descendents of the choir’s Irish founder. Mrs Fitzpatrick was a school teacher who voluntarily came to Australia after her husband Bernard was sentenced to transportation for embezzlement. She trained a small group of singers, including her own sons, to sing for the first Catholic services in the colony. As Sydney grew, they became the choir of the first St Mary’s church and eventually the St Mary’s Cathedral Choir. Mrs Fitzpatrick was the choir director for many years. Melbourne resident Neill Fitzpatrick discovered he was the great-great-great grandson of Catherine Fitzpatrick when he was researching his family tree last year and was impressed by his talented ancestor. “She was a woman well in advance of her time because she was highly educated and a school teacher,” he said. “She was either very naïve or very courageous to come out in 1811 as a free settler with two young sons, the youngest of which was less than one year old. Mr Fitzpatrick joked that singing is one family talent hasn’t been passed down the generations. “I can’t sing at all,” he said with a laugh.